In 1989 Czechoslovakia reverted from a Communist system to a Market economy and sought closer ties with the West to strengthen the new democratic institutions. In particular they looked to Britain as an inspiration. In 1991 Bridgwater became the first town in the UK to twin with a Czech town-the Moravian town of Uherske Hradiste. The Bridgwater-Czech/Slovak Friendship Society which had been set up to further develop these links, expanded its contacts all around the former Czechoslovakia-which seperated in 1992 into the Czech and Slovak Republics. The years of Communism had left the Czechs with a high level of education , a highly skilled workforce and a low wage economy on International markets . The new Civic Democratic Government set about the transformation into a model market economy and currently has only 3% unemployment, 9% growth, Associate member status of the EC and the lowest inflation in the region. Keen to build on its stability, the Czech Republic seeks to join NATO, bringing its armed forces up to Western compatability, and to encourage Western investment. Although British investment in the Czech Republic currently stands at £200million this ammounts to less than 8% of the total and compares badly to the USA with 13% and the Germans with 30%. Scope for trade with the Czech Republic-which is outstripping Slovakia considerably, has been exploited by numerous British companies notably Unilever, Shell, BP, Bass,Anglian Water and the Midland bank. Recently the first TESCOs opened in Prague. Also, Czech currency is now easily available in British banks. 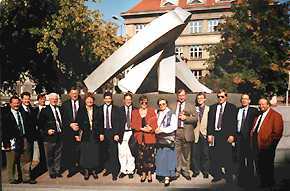 In 1995 the Bridgwater Czech/Slovak Friendship Society took a TV documentary team on a tour of the Czech Republic with Somerset business people and in 1996 helped organise an inward marketting mission to Somerset. 1997 saw the second leg of that mission to the Czech Capital Prague with 28 business people participating and 6 contracts signed thus taking advantage of this unique window of opportunity and helping us to consolidate Anglo-Czech links into the next century.